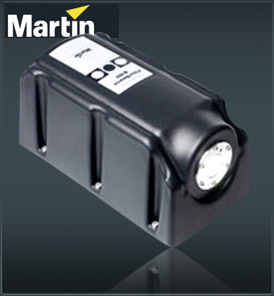 The Martin FiberSource B150 is a 150W light generator for fiber optic installations that can receive up to 800 flexible 1mm fibers. It has a weather-resistant IP rating of 44 that enables it to be used in outdoor installations. color filter. A wide range of filters is available from your Martin dealer. The Martin FiberSource B150 is compatible with all major fiber manufacturers. Fiber optic installations ideal for retail and displays, or heat and UV sensitive applications such as for artworks and museums. A single light source for multiple light outlets is an excellent means of reducing lamp replacement costs.